Welcome to the Gibraltar Neighborhood Association website. We are so proud of our historic neighborhood, and our residents work hard to make it a great place to live! 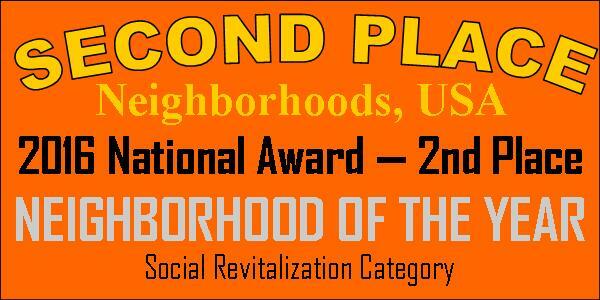 In fact, in 2016, we were awarded SECOND PLACE in the Neighborhoods, USA (NUSA) National Competition under the "Social Revitalization" category, beating other neighborhoods from around the country! (Learn more about NUSA at www.nusa.org). Watch our conference presentation on what we accomplished in 2016 by clicking on the video link, below. The Gibraltar Neighborhood Association (GNA) encompasses a large number of homes and businesses in an area east of the Council Bluffs public library. Our approximate boundaries are from the top of 5th Avenue west to 4th Street, and from 9th Avenue on the south edge all the way north to St. Peter's church! (To see an actual map of the GNA boundaries and other Neighborhood Associations, click here. GNA's map is on pg 10). Our neighborhood also includes the Willow/Bluff/Third Street Historic District which is on the National Register of Historic Places. For a comprehensive description of many of the historic homes in the district, ﻿click here﻿. So, how did we get our name? One of the most striking formations of the Loess Hills used to stand at the southeast corner of 5th Avenue and 3rd Street. Standing at least 250 feet high, this large dirt formation was known as "Gibraltar." According to Silent Hills Speak, History of Council Bluffs by William E. Ramsey and Betty Dineed Shrier, the tower cliffs of Gibraltar (likely named for the global landmark at the entrance of the Mediterranean Sea) were an area fixture in the neighborhood for as long as early residents can remember. There are two photos of this formation prior to 1955, when the city removed the mound for housing expansion. Our Association logo was designed from these photos. Learn MORE about our great neighborhood by clicking on the video below -- it was our submission for the Neighborhoods, USA competition! The next GNA General Meeting is scheduled for Thursday, March 15th from 6:30-7:30 p.m. We'll discuss the latest news from the neighborhood, projects currently underway, and upcoming initiatives for the new year. ​W﻿e need your input, suggestions and experience to make our neighborhood a clean, safe, wonderful place to live! Our business meetings are held in a variety of locations (people's homes, The Center, The American Legion, The Dodge House, Our Savior's Lutheran Church, etc.). We also have frequent SOCIAL meetings that are held in a variety of places (resident's homes, the park, a local watering hole, etc. ), so watch for news on those! We currently have a couple different ways to communicate, but are hoping to narrow it down to one. Please join our Private Neighborhood Networking Site at www.gibraltar.nextdoor.com. This group is only open to those within our neighborhood boundaries! It's a great way to keep in touch and get to know each other. There is also a yahoo email group you can join if you prefer. Simply go to http://groups.yahoo.com/group/Gibraltar-NA/ and click on the blue "Join This Group!" button. Thank you!